Cooperstown is a village of about 2,000 people located on the shores of Lake Otsego. It's full of quaint small-town charm, such as its one traffic light, but during the summer months the population swells with visitors. As a resort town, there is more lodging than the population might suggest, though it can be difficult to get a reservation during the busy summer months. Cooperstown has most of the amenities that a visitor would expect. Local amenities include the Clark Sports Center, pizzerias, sandwich shops, coffee shops, bars, grocery stores, banks, a pair of gas stations, and quaint Main Street shops. The areas surrounding Cooperstown offer additional services and necessities including movie theaters, discount stores, shopping malls, concert venues, and antique shops. Students have the opportunity to become active members of the local community. Some work with area businesses; some attend local churches and synagogues. Others take advantage of Cooperstown's pristine location with hiking, camping, canoeing, kayaking, snow shoeing, and cross-country skiing excursions. 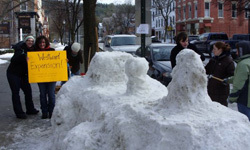 The Class of 2011 builds a snow sculpture on Main Street during Winter Carnival 2010. They won first prize! 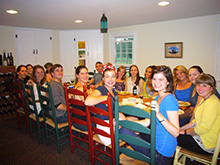 The Class of 2014 enjoys a class dinner. Jenna Robinson ('13) goes apple picking in nearby Middlefield. 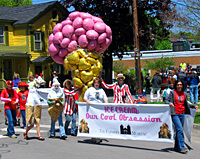 The Farmers' Museum Ice Cream exhibit representatives in the 2007 Hall of Fame Game parade.